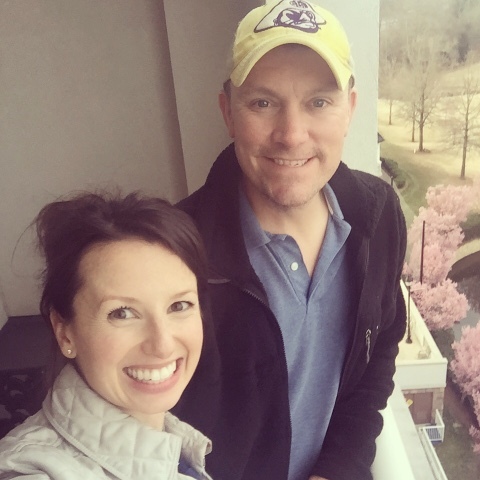 Our pre-baby staycation ... aka, the time I took way too many selfies. The story starts with a gift under the Christmas tree that I was SO excited to give my husband. Two nights, early February, complete bliss awaiting us at The Sanctuary in Kiawah. We even talked about adding on a third night in Charleston at a little B&B just to catch some favorite restaurants down that way. THEN we realized that our getaway was booked for Super Bowl weekend. THEN the Panthers made it all the way to the Super Bowl (who knew?!). And after lots of discussion we both decided that we didn't want to be at a quiet and serene resort for such an exciting evening ... we wanted to be here in Charlotte with some of our best friends celebrating! So, that trip got cancelled, and it was looking like we were just out of our opportunity to enjoy a second little "babymoon." But then, we had the idea for a little staycation! (If you hate the words "babymoon" and "staycation" then I can't blame you ... but hang with me here). I've enjoyed several spa days at The Ballantyne Hotel before but had never been an overnight guest with them. Ian's mom came in to stay with Camille, which they both loved, and he and I drove down 20 minutes to this awesome resort. We took a chance and booked the least expensive room, and upon seeing the watermelon under my shirt they took a little pity on us (ha!) and upgraded us to an absolutely beautiful executive suite. We had two full bathrooms, a living area separate from the bedroom, and two balconies. 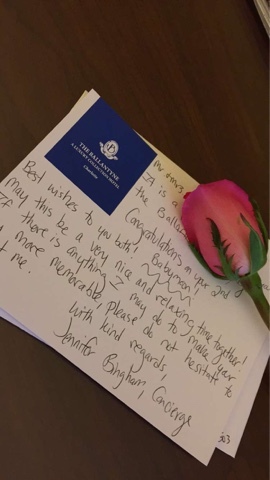 When the concierge brought our luggage up to our room, she'd also taken the time to write us this note and include a pink rose. Not a single detail here was missed! After hearing such great reviews about Gallery Restaurant right there at the resort, we decided to book 8:30 dinner reservations there that night, giving us a few hours to just relax in the room and kick our feet up. I posted the above photo on Snapchat (@alizadventures) ... I took the most glorious, long bubble bath before dinner and then took my time redoing my makeup, curling my hair, and getting dressed. 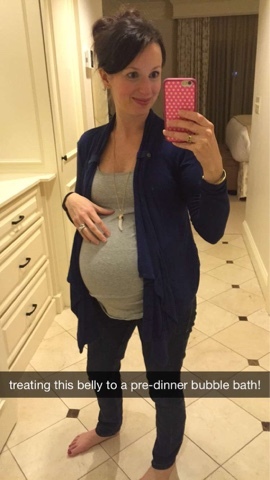 This is one of my favorite maternity ensembles and it's all so inexpensive ... denim jacket from Steinmart, bodycon maternity dress from Old Navy, gold wedges from Walmart -- yes, they were a find! I did have on a new necklace that I kept from one of my Rocksbox shipments -- the Perry Street Kylie necklace. I love the antiqued gold chain and tassel with the rhinestones. 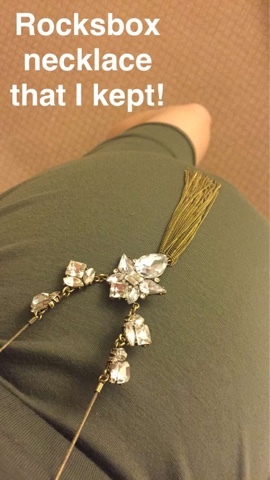 I think having a baby bump is the perfect excuse to rock a long necklace with a tassel! using my referral code at checkout: alizadventuresXOXO. if you love the boxes as much as I do! Dinner that night was just awesome. The bartender hooked me up with a beautiful little mocktail that featured fresh strawberries and rhubarb syrup. Ian and I shared two appetizers, and I had a gigantic ribeye for my entree that was delicious. We even split a chocolate dessert. We had such wonderful conversation and kicked ourselves later for not getting a photo taken at dinner! After breakfast together the next morning, Ian had two buddies to join him at the golf course for a round of golf and I headed to the spa. 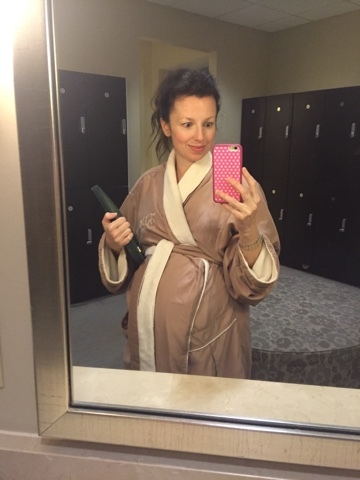 I spent a little bit of time at the indoor pool (I was a woman on a mission ... I was doing headstands and flips in the water, trying to see if the baby would spin around from the breech position) and then got ready for my 11am prenatal massage. The massage was just heavenly. This has been my third prenatal massage in the past month or so ... YES, that's quite a bit, but I'm not hating it! After my massage, I drove Ian's car back home so I could catch Camille before her afternoon nap. Ian returned home later after catching a ride with his guy friends. We talked SO much about how wonderful this little escape was. We had awesome conversation, we laughed together so much, we truly relaxed, we even slept in until 8:30 on Sunday morning! When the new baby comes, we won't be doing many overnights away, but once things settle down after a while we'd love to plan another night away just like this one. This sounds like absolute perfection!! I had a weekend booked at the Ballantyne and the spa for my mom and I over Superbowl weekend but like you guys, I didn't want to miss all the excitement. Hoping to re-book later this summer! You look so gorgeous, you are glowing! Yay for the room upgrade- such a nice surprise! I'm going to say the concierge's note/flower is an omen - pink rose = pink for a 2nd girl! I love the Ballantyne spa!! 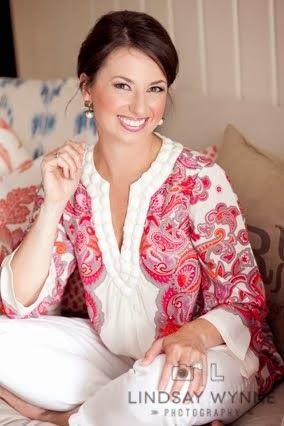 When I was in Charlotte, we went for a day of pampering. It was about six years ago and we are still talking about how awesome it was. Personally, I think it's one of the best spa's in the country! Sounds like it was a perfect BabyMoon. Awww the staycation sounds just perfect! And that note from the concierge was so sweet! Ballantyne is our favorite! Especially for a date night, brunch, or high tea. Looks like y'all had a nice time. Sounds like a heavenly babymoon. 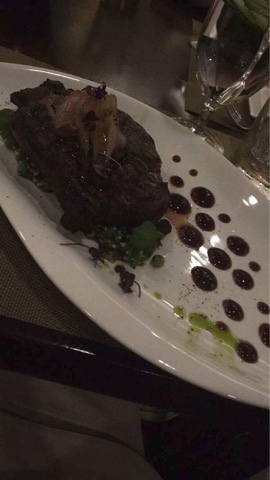 And that ribeye looks so good. We won a weekend stay at the ballentyne during steeplechase last year! I am pumped and we are using the trip in a few weeks! That necklace from Rocksbox is so cute! Heck, every necklace in this post is! :) looks like an amazing time!! Yay to a room upgrade! Glad y'all got to have such a great time together before the baby gets here - babymoons are so needed! Well that sounds perfect! My aunt and uncle gave us a one night stay at a new small hotel in downtown morehead and we are saving it for late summer..def not a resort but I can't wait to use it after baby for a little "staycation"!! So fun! We have stayed here, too, and also REALLY enjoyed the Gallery Restaurant. Now that you've mentioned this place, I'm thinking a repeat trip is a must! So happy y'all had a great time! WELL deserved, Mama! Looks like the perfect little getaway! Bryce and I haven't traveled anywhere just the two of us in a while and I'm itching for one myself! I love that Rocksbox necklace you picked!